You are here: Home / November Digger is out! 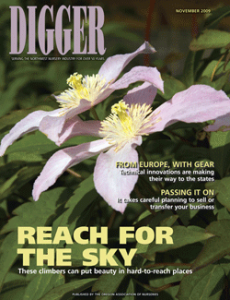 The November issue of Digger magazine is out, and the feature article this month is on climbing plants and vines (PDF), including clematis, climbing hydrangeas and more. Also readable online are articles on spots, rots, rusts and cankers (PDF), and saving money with efficient irrigation systems (PDF). To get the entire issue, subscribe to Digger – it’s free for nursery industry professionals. And for information on our advertising opportunities, check out the 2010 OAN Exposure Kit.